the laying of its foundation stone in 1914. This was the first of 10 major events over a 5 month period, culminating in November 2014 with a service presided at by the Archbishop of Perth Diocese to commemorate the consecration of the Church. This was followed by a commemoration dinner held in the Church. It is very rare for a Church to be a place of worship for its entire life but the Church of the Epiphany has an unbroken record of worship in the community over her 100 years. As well as organising events and activities to celebrate the centenary. Our foundation stone was beautifully restored. The stone, faded by 100 years of weathering was brought back to life and the original gold painted lettering was replaced with gold leaf. 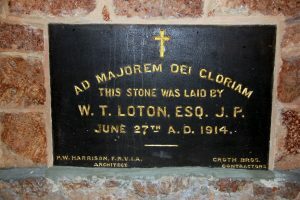 The foundation stone sits beautifully in the stone wall of the church and looks magnificent. Extensive restoration of the outside of the Church, painting and replacing the woodwork and finishing off the northern parapet of the Church that was never completed when the church was built in 1914. This work complemented a program of conservation and development of the church and her buildings and beautification of her grounds. Famous local artisans Joan and Charlie Smith were commissioned to create a sculpture of a Dove entwined within the circular love of God and suspended by the seven fruits of the Holy Spirit. The Dove measures approx. 1200mm from wing tip to wing tip and takes pride of place above the Sanctuary of the Church. crafted from primary sourced historical and recent documents into delightfully interesting and attractive pages of information and pictures. In addition, scrapbooks were crafted about the centenary celebrations as a lasting memory. A book of recollections from 100 people whose lives touched that of the Church over her lifetime entitled Stories in Time was collated and provides a collective snapshot of those who have given the Church life. We felt our Festival of Epiphany service in January 2015 was the right time to bury our centenary time capsule. The capsule contains a lot of information about the centenary, including some of the centenary merchandise. It is to be recovered in 2064. Mundaring Weir, Sawyers Valley, Chidlow, Wundowie, Wooroloo, Mt. Helena, Stoneville, and Glen Forrest. Growth in population made it imperative to have a permanent building in which services could be held, and to this purpose an acre of land was granted by the government on a 999 year lease. 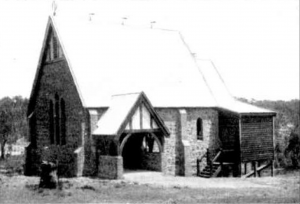 The foundation stone for the Church of the Epiphany was laid on 27th June 1914 and the church was consecrated by the Archbishop of Perth on 14th November of that year. The whole of the stone required was donated with the total cost of the building being 605 pounds. 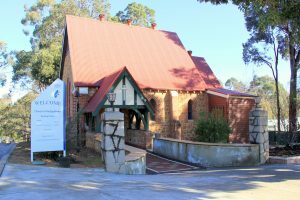 Local Mundaring residents raised money to build the Church and today she is a local centenarian icon that remains a Church of the people. 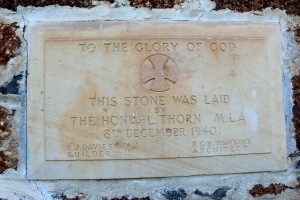 The land had been a gift and the foundation stone laid on 8 December 1940. 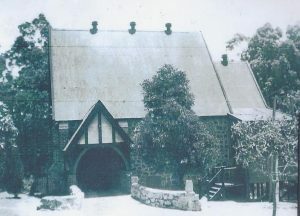 The completed church of ironstone and tile was consecrated by the Archbishop on 29 March 1941. 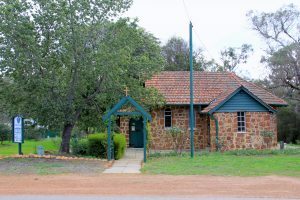 The church is a much loved part of the Wooroloo community.